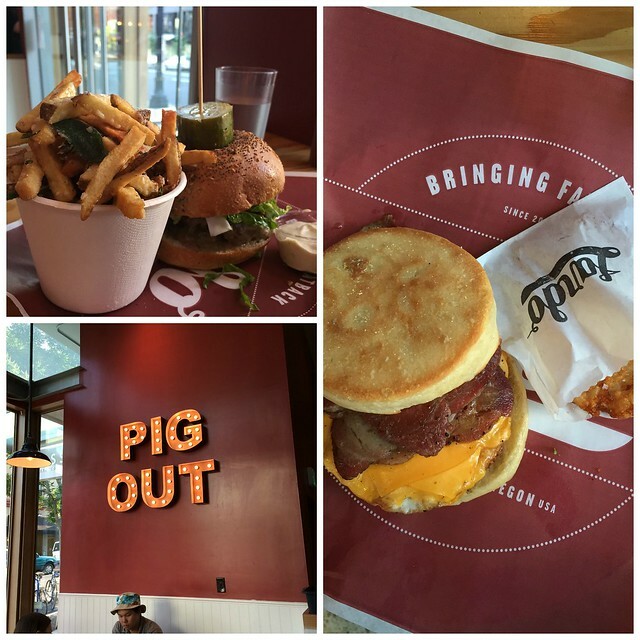 A recap of our quick weekend in Portland, Oregon for the Indulge Conference. Which means a weekend full of walking, shopping and lots and lots of food! 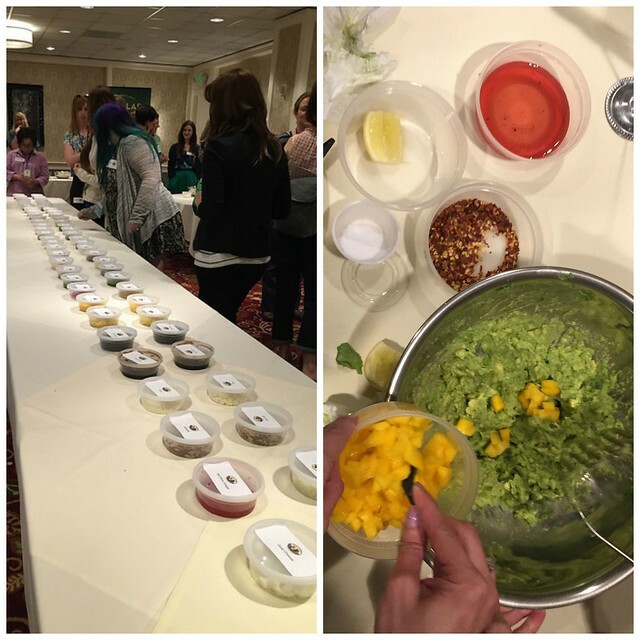 A couple weekends ago, I traveled to Portland, Oregon for the first ever Indulge Conference. It was a weekend full of walking, shopping, laughter and lots and lots of food. This trip was extra special because I took my boyfriend with me. Normally I wouldn’t ask him to tag along on a blogging event and expose him to our crazy world (as if he doesn’t get enough of it at home). This time however, it was so exciting to have him with me in Portland and to meet a few of my girlfriends that he hears about all the time! I am not sure which one of us enjoyed Portland more! We arrived Friday night and took the train into the city. We immediately checked in our hotel and headed out for dinner. Our first stop was at Lardo. Whew! We were more than pleased. I had a breakfast sandwich with a homemade English muffins and a hash brown. My boyfriend has a burger and some Lardo fries which have melted parmesan cheese on top and we split a local brewed root beer. It was all so awesome! I would absolutely visit there again sometime. As the evening set in, I was ready to hit the town and explore a bit. We headed to what I called “up town” and stopped in a couple local restaurants along the way. 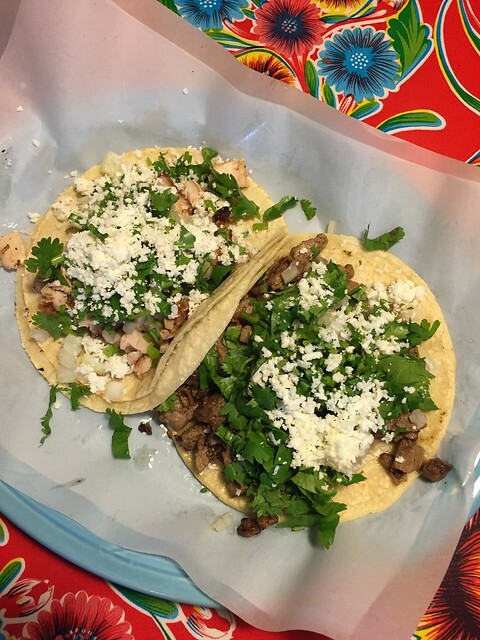 We wanted to sample some small plates at a local tacoria and burger spot. I know what you must be thinking: really, more food? Yes. That’s jus how we roll when we have two days to take it all in. There are SO many restaurants to choose from. 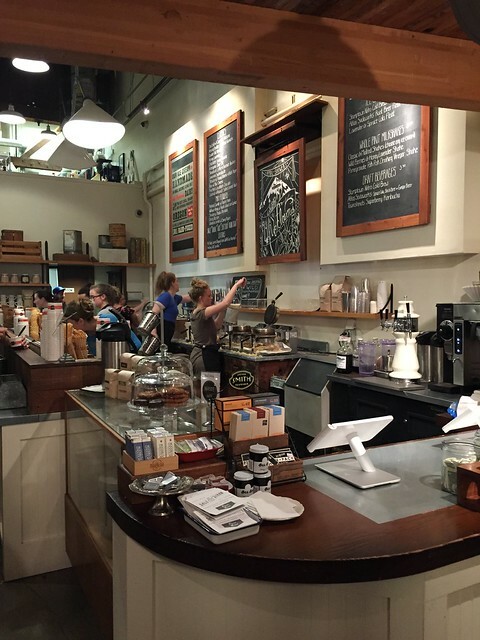 Our final stop of the night was at Salt and Straw Ice Cream. The line was long, really long. My boyfriend was questioning my plans, but HELLO?! I kept telling him we had to have it. Well, 45 minutes later, we were at the front of the line sampling as many flavors as possible. There are two things my boyfriend loves: chocolate and snickerdoodle cookies. I thought for sure he would go with one of the chocolate options, but instead he ordered the Cinnamon Snickerdoodle Cookie Ice Cream. After his first two bites, he was changing his tone about the long wait. In fact, we returned again on Sunday for a second helping and were pleased to see a shorter line. 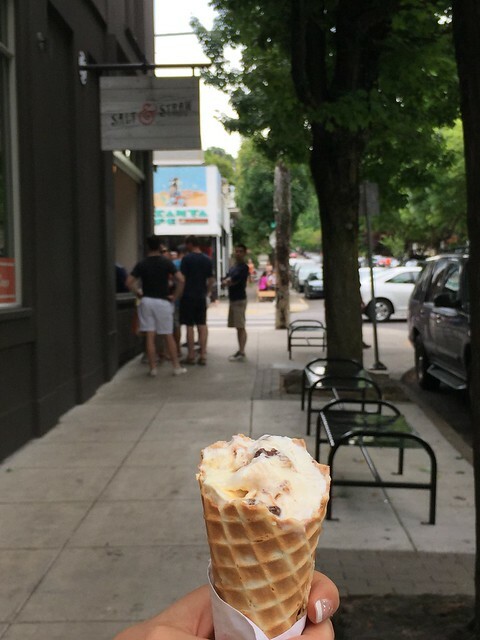 I had the Stumptown Coffee Bourbon Ice Cream and some Vanilla Almond Brittle. Both were absolutely amazing and I am making a trip to the LA location ASAP. You guys, you have to go to Salt and Straw, no matter how long the line is. They make their own waffle cones and the girl behind the counter was seriously cranking these out. Saturday was jam packed with activities. The Indulge Conference was organize by Lauren from Lauren’s Latest and her friend Christie who does event and meeting planning. These girls did such a fantastic job! There was plenty of surprises in store for us. 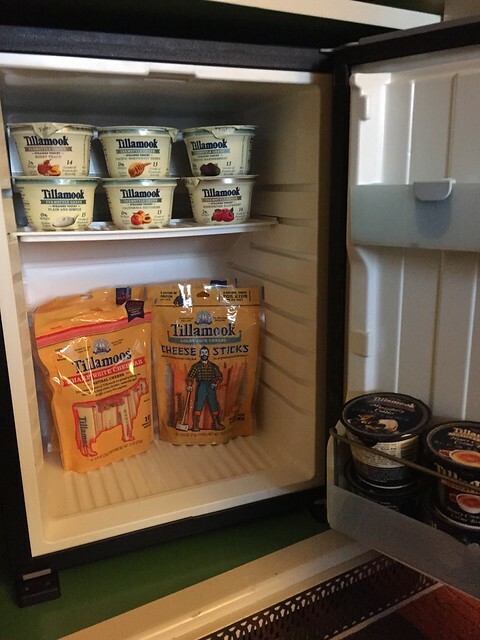 Our rooms were stocked with Tillamook cheese and yogurt. I ate as much cheese as I could over the weekend, it was a nice break from all the sweats I was eating. 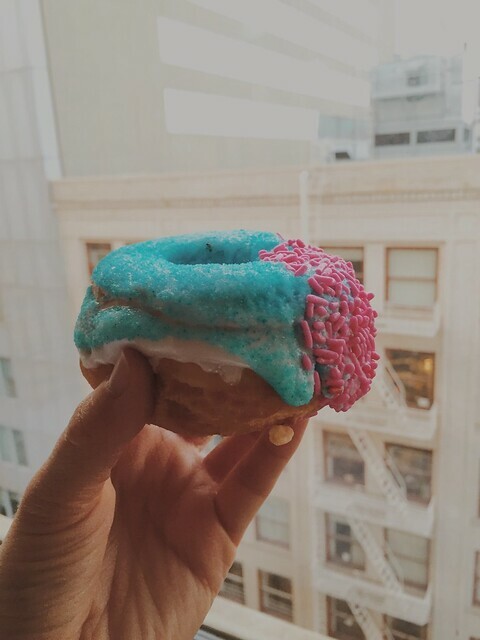 Plus, we had a box of Voodoo donuts waiting for us! Cha-ching! The conference was at Hotel Monaco, which is a part of the Kimpton hotel chain. 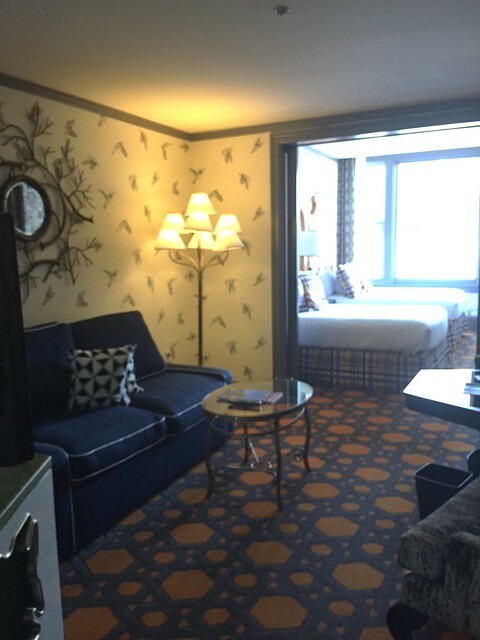 I have to say, I always want to stay in Kimpton hotels whenever I travel now. Do you know they have a complimentary happy hour? Plus the décor is freaking awesome! During the conference, we were treated to snacks from OXO, Harry and David and Kroger. 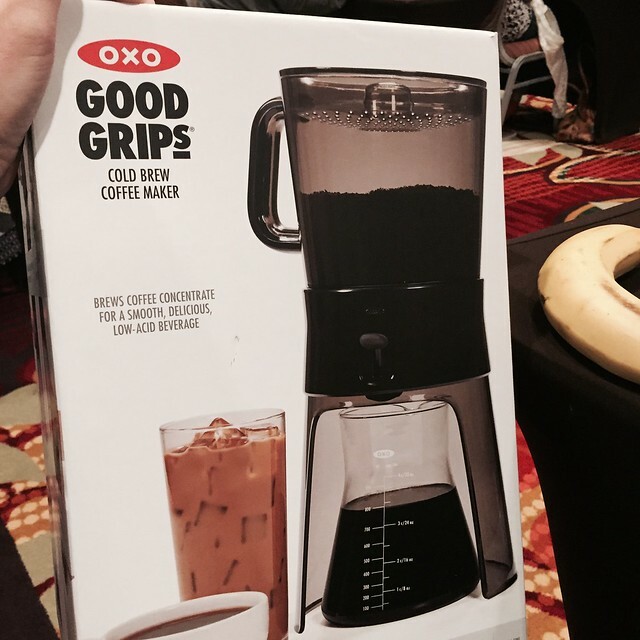 OXO was debuting their Cold Brew Coffee Machine, which was just the pick me up I needed. Plus I won a machine, which I am SO pumped about. Hello, I am Julianne and I am addicted to iced coffee. I can’t wait to give it a try. Mid-way through the day, we have a Guac-off sponsored by California Avocados. Let me break this down for you. We were divided into teams, and one person from each team had to run up to the table of ingredients and grab one thing in a matter of 15 seconds. This was pretty cut-throat if I have ever seen it. Once all 5 members had an ingredient, we had 5 minutes to make a guacamole. The panel of judges narrowed 15 teams down to the top two and eventually picked a winner. I have to say, it was the most stressful guac I have ever made, but entertaining non the less. This is the calm before the storm. The sessions at Indulge were awesome. One of the reasons I decided to go was because of the line up of speakers. We talked about more than just your basic blogging how-tos. 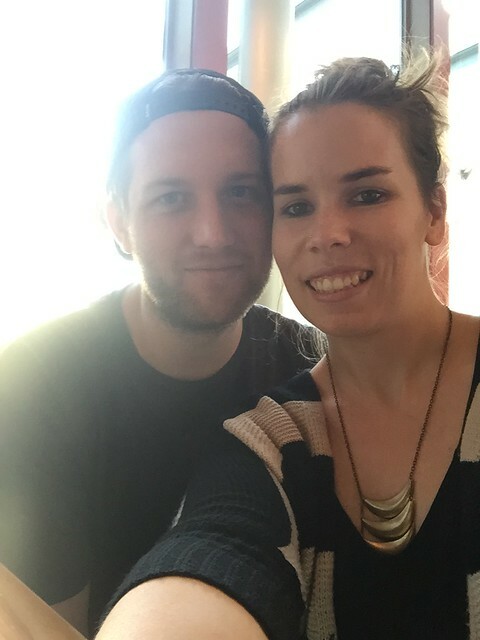 Kristen shared her story about life outside of blogging. She brought me to tears and also made me laugh within the same few minutes. Sometimes it’s easy to get caught up in all the responsibilities we have as bloggers and it’s hard to shut it off. Kristen has such an inspiring outlook on balancing her life between work and personal/family time. We had a very valuable session about tips to working with a virtual assistant and a little bit about monetizing your blog with ads. We took a break for lunch and had the chance to explore the city and food trucks a little bit. I opted to visit the “Dump Truck” which was fresh dumplings. I had a variety pack, and my favorite was the bacon cheeseburger, duh! During lunch I also snuck away to a nearby bakery called Petunia’s Pies and Pastries. The shop was particularly adorable, and I wanted to buy everything. 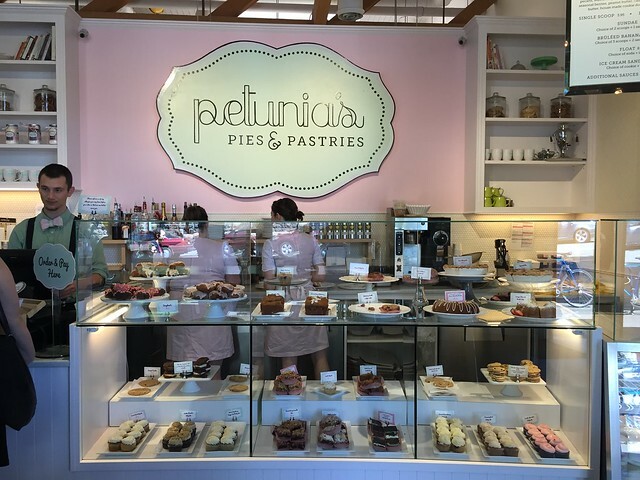 The best thing about Petunia’s is that it was an all gluten-free bakery! I had their salted caramel chocolate chip bar and a vanilla cupcake. Had I not known that it was gluten-free, I never would have guessed it. In the afternoon, Bev, Lori and Deborah talked about tricks to grow your social media. This is a constantly changing platform, so it’s great to hear from a variety of people what works for them. Shawn talked about her strategies for working with brands, which is something most bloggers can relate too. We finished the day with a photography sessions led by the talented group of Heidi, Ali and Amy. Teaching a photography class at a conference is tough, but I have to say, these three hit it out of the park. I was furiously scribbling notes and upon returning home, I put some of those tips to good use! I finished off the day with dinner hosted by California Avocados at Clyde Common. 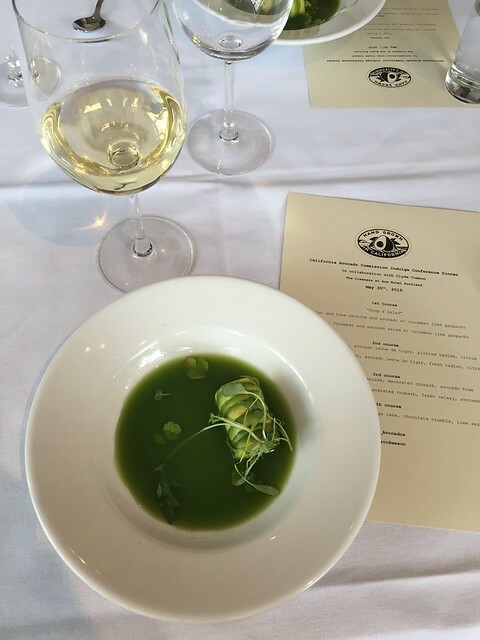 Each course we were served creatively incorporated avocados. My favorite was the tuna and halibut tar tar that was rolled in avocado, just like a sushi roll. It was so tasty! A special thanks to California Avocados and Clyde Common for hosting us! Lets talk donuts. I ate my weight in donuts over the weekend. 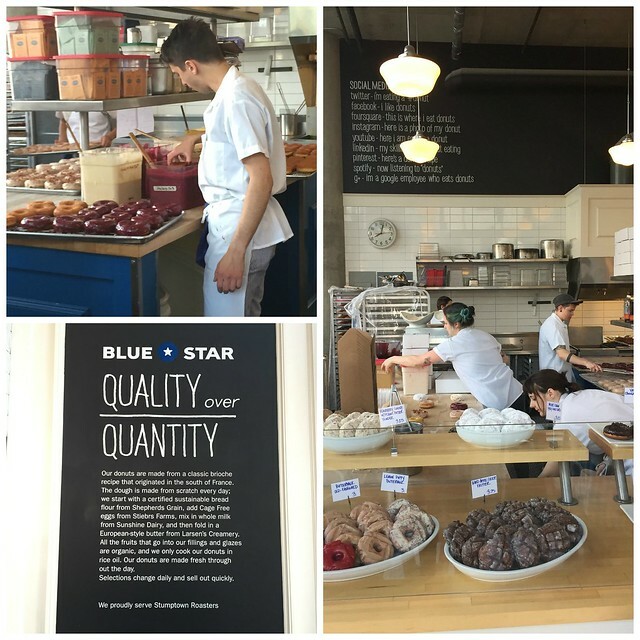 Saturday AM, Krista, Gerry, Deborah and I snuck off to Blue Star Donut before the conference started. Holy FEAKING cow!! I had an assortment of flavors to taste including their classic buttermilk glazed donut, Mexican chocolate, a powdered sugar donut filled with Meyer lemon and lime curd and their vanilla cream filled chocolate donut. Each donut was unique and so stinkin’ good, but the buttermilk glazed donut blew my mind. I even returned Sunday morning so I could get another fresh one. Since they change up their flavors daily, I was also able to try the Cointreau crème brulee and a blackberry bourbon basil glazed donut! 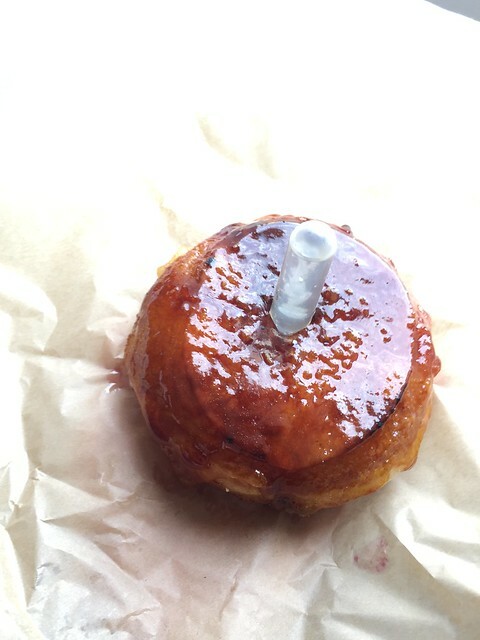 The topping as a little too hard for me, but the filling and pipette of Cointreau was insane. Sunday there as just more food. We stopped at Voodoo Donuts, because, when in Portland. 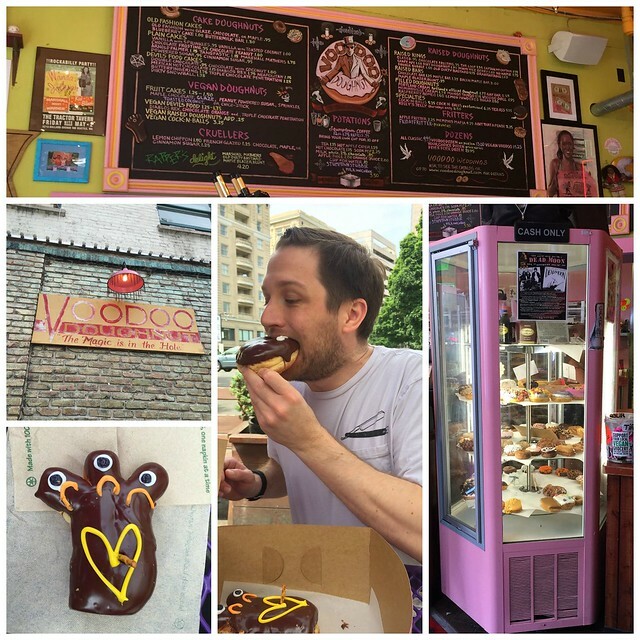 My boyfriend preferred Voodoo Donuts since he prefers yeasted donuts. I preferred Blue Star, but both are totally worth visiting; even more than once. I love the rotating donut bar and the creative combinations from Voodoo. I was fortunate enough to be able to meet up with my friend from high school that I have not seen in 4 years. It was nice to spend the day with him and his girlfriend. We also dragged them shopping and for more eating. During the conference on Saturday, my boyfriend spent time enjoying the city. He walked all over the place to the different skate and snowboard shops, ate at a few local spots and just sort of hung out. 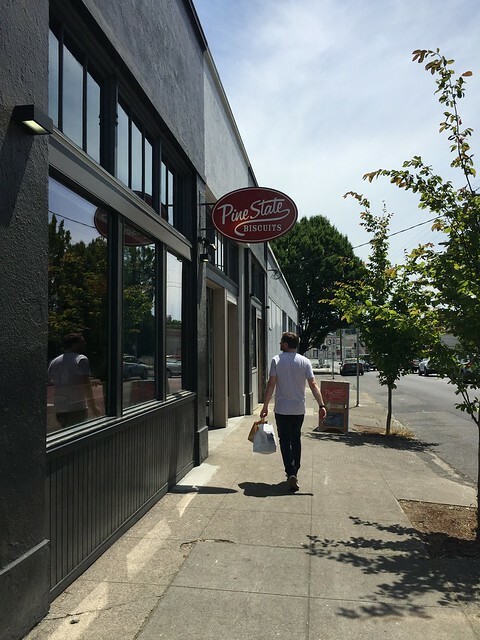 He had lunch at Pine State Biscuits, and thought it was so good that he had to bring us there. The whole menu is based around their mouthwatering, flaky biscuits. I had the fried chicken and eggs on a biscuits with gravy and I ate every last bite. This place was life changing. 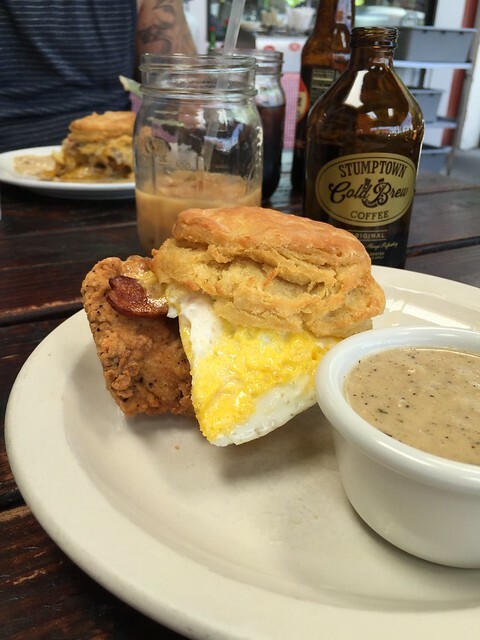 I wish we had a Pine State Biscuit location in LA. Our trip was incredible despite how short it was. 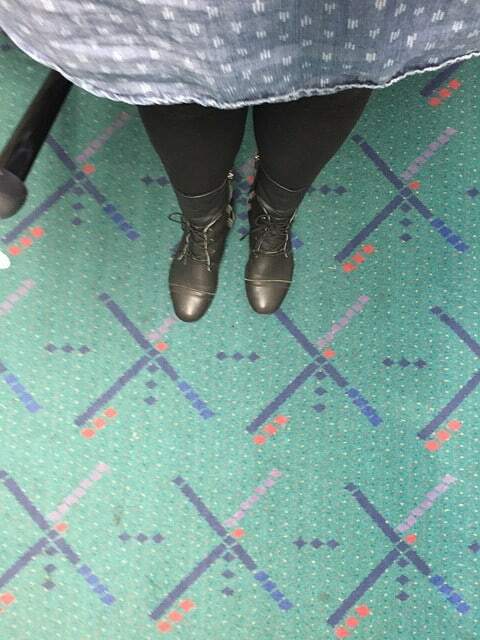 We fell in love with Portland, even though we had a great weather, the city itself was so much fun. There was no shortage of places to eat and the transportation was pretty easy. We Ubered a lot, but the city itself wasn’t too massive, so it was good to walk around. 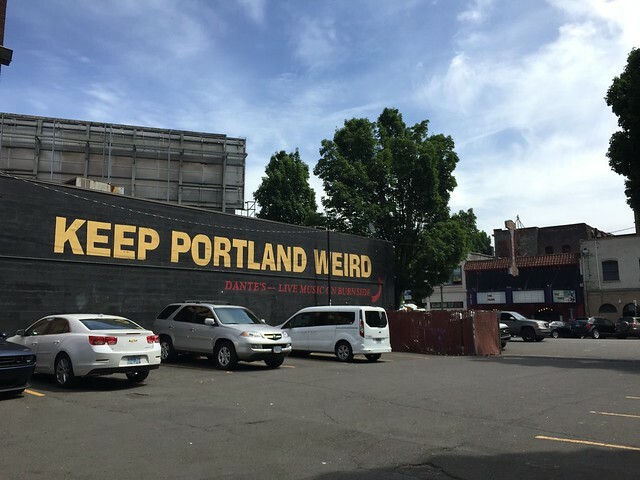 I really hope we have a chance to visit Portland again soon. And if you are a blogger reading this, I highly recommend looking at the Indulge Conference to attend next year! It is an intimate setting, so you really got to connect with the other attendees and the quality of content was among the better I have attended. Thanks again to Lauren and Christie for all the hard work and to the sponsors who helped make this event possible! I’m totally bummed I missed it, but glad you and Dell had fun. 🙂 All the food looks SO GOOD! And a guac competition? Tell me you slayed it. I know you make a mean guac. Love your recap and I am so sad that I had to miss it! Your shoes in the first picture!! So awesome! Mind revealing the brand and where you got them?? Color me green with envy! I totally wish I could have been there. Next year for sure! OH portlandia how I miss you!! Looks like you had a delicious time!! I must tag along somehow next time. What an amazing delicious trip! 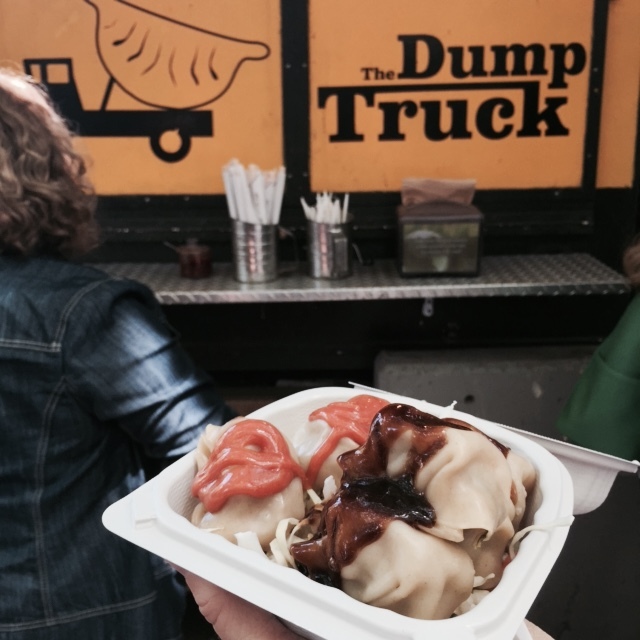 A dumpling truck called The Dump? I love that! 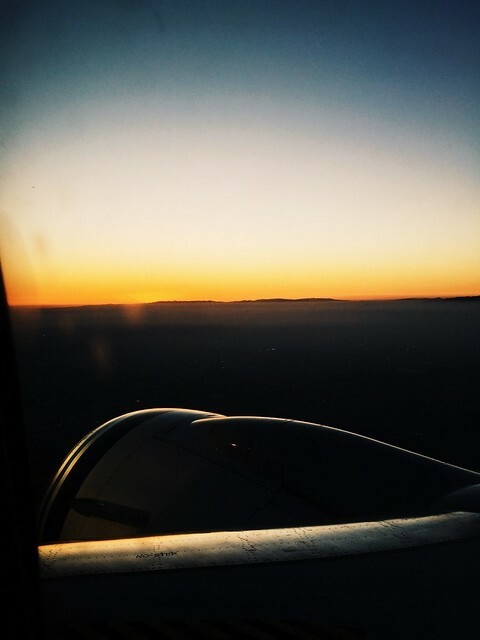 Thanks for sharing your adventure; it has me drooling! Wow! It looks like you had an amazing time! All of that yummy food and some great speakers too!